 The 2018 winter sports season at NCS was one to remember! The two words that best describe the season are: dominance and perseverance. Both the junior high boys basketball and girls volleyball teams had a season of utter dominance. Both teams seemed to have one goal in mind—just win! The boys basketball team entered the season with a familiar core from a year ago, while the girls volleyball team added some fresh faces; including a new head coach. The boys basketball team cruised to a 5-0 start in their division. On February 8, the boys suffered their first loss, in an overtime thriller, to King of Kings Lutheran. The boys would go on to finish the regular season 7-1. The boys dominated their first round matchup in the league playoffs, and found themselves in the division championship. The boys would face a familiar foe in the championship game—King of Kings Lutheran. The championship game was a back and forth affair in the first half, until the boys caught fire from three point range in the fourth quarter. As time expired, the boys had rushed the court to hoist the division championship trophy! The girls volleyball team started their season off to a 7-0 start, and were one game away from an undefeated regular season. On February 20th, the girls traveled to Eastside Christian to play in their final regular season game. The girls suffered defeat in their final game, and headed into the playoffs with a losing streak for the first time all season. A chance for redemption would soon come when the girls faced off against Eastside Christian in the first round of the playoffs. The girls were victorious in a close game against Eastside, earning a trip to the championship game. The girls would face off against King of Kings Lutheran in what has now become a budding rivalry between the two schools. The girls took an early, ten-point lead in the first set. King of Kings came roaring back to take a 21-18 lead. The lady Seahawks fought back in a nail-biting finish to take the first set. The second set saw a role reversal as King of Kings got off to an early ten-point advantage. The lady Seahawks would not be denied a championship as the came back from the deficit to win the division championship! The girls and boys championship victories made school history! For the first time, all four junior high sports teams won division championships in the same year! 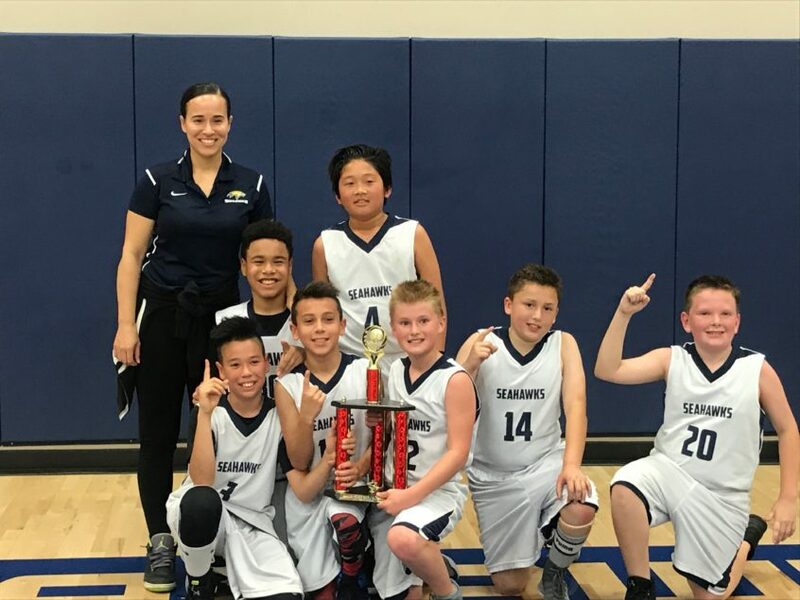 The elementary sports teams faced a season of adversity, but in the end found themselves in position to come home with championship hardware. The elementary boys A & B basketball teams both had rollercoaster seasons. 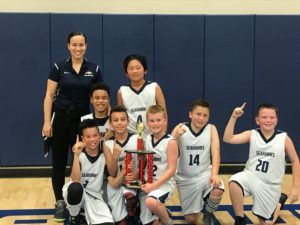 The elementary boys A team got off to a 3-0 start to their season, while the elementary boys B team started their season with three straight losses. Both teams had a reversal of fortune, as the A team went on a three game losing streak, and the B team went on a three game winning streak. One thing was true of both teams, if they were going to win it all, they had to dig deep and push through. Both teams ended the regular season with four wins and four losses. The A team won their first round game and found themselves in the championship game for their division! The B won their first playoff game in their inaugural season! The B team would unfortunately suffer defeat in their semifinal matchup. The A team was poised however to take home the trophy. They would play Huntington Christian, a team who had beaten them both times in their two regular season meetings. As the saying goes, “third time’s a charm”. The boys dominated Huntington Christian, taking home back to back championship trophies! 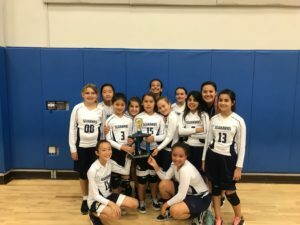 The elementary girls volleyball team had a season met with early defeats. The girls had a new, young roster filled with first-year players. Coach Aguirre motivated the girls do defy the odds.  They finished the regular season with just two wins, and found themselves in a “David v Goliath” matchup with the undefeated Independence Christian. The girls played their best game of the season that day! Down 22-18, it seemed like it was going to be the same story, “they fought hard but came up short”. However, the girls took Coach Aguirre’s message to heart and rallied of seven straight points to take the first set! In the second set, it wasn’t the experienced girls that came to play, the first-year players stepped up to the challenge and lead the team to a victory over the first place Patriots! The girls found themselves in the championship game, hardly anyone expected the girls to be there, but they did it! They would suffer defeat in the championship game, but their second place finish was one they can be proud of!